Here’s the problem: I’m almost 48 years old, but I still think like a 25 year old. The other morning, while enjoying the first satisfying, coffee-induced pee-break of the day, I had a great idea. I was going to set a goal, something random and impetuous and completely spontaneous. It was going to be heroic and newsworthy. People were going to root for me, and I’d be all over social media: my YouTube videos would go viral, people would follow me on Twitter, and I’d have thousands of fans on my Facebook page. All this would come to me because of the goal I set. I was going to ski every day that Stowe Mountain Resort was open. No matter what the weather, no matter what my middle-aged life demanded, no matter how I felt every day, next year I was going to ski every day that the ski area was open. I was going to be a real hot ticket, a hoot, a character. All this occurred to me while I was peeing. It’s important to understand where I am when I’m peeing. I can look out the bathroom window and see Cady Hill, and on this particular morning it was frosted with snow. The late March sunrise lit the landscape and filled me with a feeling of possibility. The view was inspirational, the morning sunshine was clean, and the world outside looked inviting. It made me think. I recalled that the ski area was still open for a few more days, and that a real tough guy, a real man, wouldn’t be standing in front of a bathroom window, daydreaming while he made water. A real man, a young, viral male, full of life and hungry for challenges, would be grabbing his gear for some of the last runs of the season--not because the skiing would be any good, but just to say he did it. That posed a dilemma: Should I answer them straight (“I’m up to day 109”), or should I play it too-cool-for-school, and just give them a steely look, nod slightly, and be on my way--as if I were The Most Interesting Man in the World? I finished up in the bathroom, carefully zipping my fly, then washing my hands. I walked over to my computer and began to type, and as I did, I realized that I was not The Most Interesting Man in the World. Moreover, because I have two teenaged sons, I was probably not even The Most Interesting Man in This House. I was a 48 year old guy who still does his thinking with a 25 year old brain: fully developed prefrontal cortex, so it’s safe for me to drive on the public roadways, but developmentally impaired hypothalamus, so it’s not safe for me to be left alone too long. I realized, as I began typing this, that nobody wants to see middle-aged guys wrestle with their notions of time. Nobody wants to see middle-aged guys lie down on a bed so they can button their jeans. And nobody wants to see a middle-aged guy attempt what is surely one of the most underwhelming feats of our time, something that thousands of people at hundreds of ski areas do every year. What they want is for middle-aged guys to get things done. They want solid leadership and a good paycheck. They want you to wash your hands after you pee. They want you NOT to make a spectacle of yourself at the party while the 25 year old, on his way to a ruddy complexion and steel-blue eyes, regales the crowd with his latest exploits from the mountain/business world/bedroom. They want to know you’re there without knowing you’re there. They want you to shut up and drink your Scotch. In 1954, while on his second African safari, Ernest Hemingway and his wife, Mary, chartered a Cessna 180 for a sight-seeing trip over the Belgian Congo. Things didn’t go as planned. Hemingway, his wife, and the pilot, crashed after the plane encountered a flock of birds. Without any means of communicating, they consoled themselves in the jungle with a bottle of Grand MacNish Scotch whisky. The next day, they were rescued by a launch called the Murchison chugging up the Victoria Nile (the boat was the same one used in the movie The African Queen). They were quickly brought back to Butiaba, in what is now western Uganda. News had already begun to leak out of Africa that Hemingway was dead. One can imagine the word-of-mouth telling of the demise of Papa Hemingway, the great adventurer. Things didn’t get any better for the writer and his wife when another plane attempting to carry them to a larger hospital crashed. This time Hemingway was severely injured, including a concussion, dislocated shoulder, a cracked spine, and a ruptured kidney and liver, among other unpleasantries. I thought about all this today while I sat on the deck of the Octagon Cafe at Stowe Mountain Resort with Chantal, sipping coffee in the warm spring sunshine. Around me the silky sounds of skiers schussing sunny slopes scattered my thoughts to what people who don’t live in Stowe must be thinking about the prospect of skiing. They must think that winter is over and skiing is dead. But it’s not. Reports of skiing’s demise have been greatly exaggerated. We were fortunate enough to bump into Stowe legend Tom Hubbs. For 11 years Tom was the voice of Stowe Mountain Resort’s snow phone, relaying the latest news and conditions about the slopes at six in the morning. It’s the most detailed and succinct report available, better than the resort’s web report. Tom’s retired from his early morning duties now, but we got to talking about the conditions, and what an amazing job Stowe has done of keeping things not just open, but excellent. Tom’s right. Stowe’s snow groomers have done better than good. They’ve been nothing short of miraculous, taking the natural snow we’ve been blessed with and arranging it on the mountain for maximum effect. It’s not smoke and mirrors, either. Up until this week, coverage has been almost 100%, and I was in the woods as recently as a week ago. The weather is supposed to cool down a little this week, and as soon as that happens, Tom said that Scott and his crew will be shaving down the terrain parks (bummer!) in order to fortify the main trails (hurray!). The net result should be more decent skiing into April. “I hope that helps you guys out,” Tom said, understanding the dynamic of snow and mountain and perception. So listen to Tom and get up here for some great skiing. Spend the morning drifting down through the bumps, nearly weightless, as you heroically negotiate previously untouchable terrain. Then hang out on the deck at the Octagon and sip coffee--or, like Papa Hemingway, something a little stronger, while you giggle about the erroneous reports of skiing’s demise. On Vermont Public Radio’s Vermont Edition today, the topic will be “Who Is a Vermonter?” The topic ignited a torrent of reflection within me: I’ve lived in Vermont for 12 years, and though I grew up on a beach just south of Boston, the mountains of Vermont are where I feel at home. I know I’ll always be a Flatlander in the eyes of Vermont birthers, and that’s okay. I’m content to admire the natives, affectionately known as Woodchucks, from a distance. But who is a Woodchuck? What’s their natural history? What distinguishes them from Flatlanders? Is there any middle ground between the two, any compromise? I’d like to offer myself as that middle ground: the hybrid Vermonter. Taxonomically speaking, woodchucks are groundhogs. They’re also known as whistle-pigs and land-beavers, an unimaginative handle evocative of horseless carriages and underwater boats. Woodchuck is a far better moniker, implying movement and action, two things native Vermonters have in spades. Woodchuck also describes one of the most important activities for any Vermonter, native or imported: the cutting, splitting, and stacking of wood. Chucking wood is the way Vermonters acquire their distinctive rounded shoulders and thick arms, not to mention their endurance. Flatlanders don’t chuck wood. Flatlanders pick up the phone and dial a number they find in the classifieds section of their local paper. A few hours later Woodchucks arrive, usually in a rusting pickup truck, filled with split wood, a mix of hardwoods, which they stack for the Flatlander in exchange for cash. I’m not a Woodchuck, but I cut, spilt, stack, and burn my own wood, from my own land. I don’t get the distinctive rounded shoulders and thick arms of a Woodchuck when I chuck wood; I get muscle pain, which I treat with ibuprofen. Though we Flatlanders fancy the notion of the connection between woodchucks and chucking wood, the real woodchuck didn’t get its name from its forestry habits. A more accurate name would be “lettuce eater” or “garden wrecker.” Native Vermonters--real native Vermonters, perhaps speakers of the Algonquin language--who trudged through Vermont’s mountains long before Samuel de Champlain arrived, called them wuchak, which is where the name came from. Like real woodchucks, Vermonters are sharp-eyed. They can see a deer at the edge of a field while driving 60 MPH down a back road at dusk. They can spot a yard sale sign from the southbound lane of I-89. And if you want to get rid of a couch, all you need to do is drag it outside your house. I once had an old reclining chair that I needed to get rid of. Like a Woodchuck, I didn’t want to haul it to the dump and pay to throw it away, so I dragged it out to the side of the road. I turned to go get the “FREE” sign I’d made for it, when I heard the squeal of tires. A young guy with shaggy hair and thick shoulders jumped out of a truck. “You givin’ this away?” he asked, his bright eyes dancing over the ratty chair. “It’s all yours,” I said. Thinking of my own dog condemned to the floor, I immediately regretted giving the chair away. I’d been out-clevered by a native Vermonter. Like real woodchucks, native Vermonters are solid, centered, and hard to flip. Ever try to roll a woodchuck? It can’t be done. Woodchucks can see you coming from a distance, and you’ll never get close enough to lay your hands on them. And when you do get close, they have a way of disappearing into the land. Native Vermonters are like that. In the town I live in, they are responsible for the operation of all the town’s critical systems: road work and plowing, water and sewer, electricity, public safety, and construction. Woodchucks form the structure of my community, and though they’re hard to sneak up on, they’re always there, quietly going about their business, while the Flatlanders busy themselves writing letters to the editor, organizing play dates for their children, and running their cars through the car wash. Calling a native Vermonter a Woodchuck is not a term of derision. To be compared with an animal that shows the tenacity and industry of a woodchuck is an honor any Flatlander would accept. We Flatlanders come here to live and play and do business because we admire the natural history of the Woodchuck. We feel like we were born in the wrong place, and we’re lucky to have found Vermont, with its iconic mountains and people to match. And then, it was over. No more disco, no more Afros, no more Bicentennial quarters. The culture moved on to thin ties, cocaine, and the polystyrene-laced McDLT from McDonald’s. There was no room for fondue in the me-centric 80s. But in Europe, fondue never experienced the obsessive highs and crashes that we Americans seem to anoint every new experience with. In Europe, fondue, and its labor-intensive sibling raclette, clung tenaciously to their culinary places in the scheme of Alpine cuisine. In Stowe, fondue staked its claim in the iconic Swisspot Restaurant. For over 35 years Carol and Gerry Good ran what many considered to be Stowe’s flagship restaurant. From 1973 to 2008 the Swisspot drew diners into the village to experience a bit of Alpine cooking in the Ski Capital of the East. But after the Swisspot closed its doors, fondue fell out of favor. After all, it was a meal consisting of melted cheese and bread, a grilled cheese by another name, a politically incorrect, artery-hardening, intestinal-binding relic from the dark ages of one-piece ski suits and olive green kitchen appliances. But at the Auberge, we still had a soft spot in our hearts for the whole ritual of fondue, and when Carol Good offered us the fondue equipment left over after the Swisspot closed--well-worn enameled cast iron fondue pots, stands, and burners--we took them with the vague notion that we’d carry on the Swisspot tradition in some form. 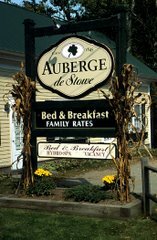 Last winter, that idea took the form of the Saturday night fondue dinners we began offering at the Auberge. As skiers, we understood the need for hearty, warming comfort food after a day outdoors in the mountains. Over the years, we’d also observed how a considerable number of our guests were happy to come back from the slopes and jump in the hot tub and relax--not everybody wants or needs to go out and party after a day of skiing. Why not offer them a fixed price menu for a fondue dinner at the Auberge? Sic semper fondue. Along with the traditional cheese fondue, dinner comes with a salad with house dressing, and a chocolate desert fondue with fresh fruit for dipping. Because it’s BYOB, guests can have a fondue-themed dinner for two for $50, including tax and tip, a near impossible feat in Stowe. The dinners have been a great success, with guests hanging out by the woodstove, sipping wine, while their dinners are prepared. And we’ve enjoyed the experience, too, taking extra time to bond with our visitors. Now there seems to be a fondue renaissance happening in Stowe, with several restaurants featuring it more prominently. Local stores are even featuring fondues for sale in the cheese aisle, and home fondue neophytes should know that many of these fondues are outstanding and easy to prepare, especially if you’re unsure of the correct proportions of wine, cheese, and kirsch. Our own supplier, Cheese Traders in South Burlington, offers a house blend of cheeses that is excellent. It’s a good time to be a cheese-dipper, and there’s plenty of winter left to enjoy fondue, so break out your platform shoes and throw an Earth, Wind, & Fire album on the turntable: it’s time to fondue.